Miss Emily Seeton is a retired drawing teacher with a gift and a whole new career. She has been enlisted by Scotland Yard to make drawings of the faces of possible criminals in places that cameras are not feasible. This time she has been sent into a London casino, quite garishly made up and dripping with jewels. She manages to capture the crime boss' face (and win quite a lot of money), unwittingly setting off a series of events including robbery, kidnapping, attempted murder, visits to the racetrack, car chases and the vicissitudes of young lovers. Miss Seeton wanders through all of this, the perfect innocent who sets off momentous events and solves crimes, all unaware. 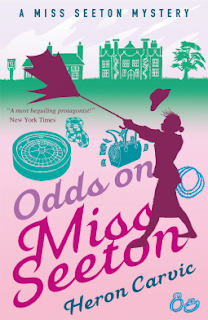 Odds on Miss Seeton is the fifth and last book written by Heron Carvic in this long-running series which was resumed by several other authors. Even though I had not read any of the Miss Seeton books it was easy to pick this one up. The series was meant as a parody of the books of Agatha Christie, Miss Marple in particular. However, Miss Marple was extremely shrewd; Miss Seeton is decidedly not. Even though Odds on Miss Seeton was written in the mid-1970's, I saw more resemblance to the Keystone Kops and the Ealing Studio comedies of the 1940's and 1950's. Ealing could have done a lot with the material, with it's non-stop action and innocent protagonist. The Miss Seeton series was written as pure entertainment and greatly succeeds This is pure escape reading. I did, however, find the extensive vernacular use a little difficult at first. I thought I had a decent command of British slang but when it comes to the criminal variety I was lost at times and decided to roll with it. Thanks to Farrago and NetGalley for an advance digital copy in return for an honest review.